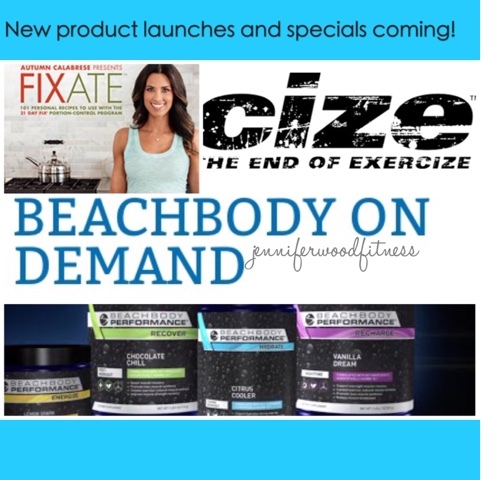 Jennifer Wood Fitness : New: Fixate, CIZE dance workout, Beachbody On Demand and the newPerformance line coming in July. New: Fixate, CIZE dance workout, Beachbody On Demand and the newPerformance line coming in July. Beachbody On Demand 30 Day Free Trial - streaming workouts. Sign up here. This group is full, but please check out my other upcoming groups here. Beyond excited for these new product launches coming in July. We are projecting even more PHENOMENAL growth in the company, so if you have ever wanted to know more about what I do as a Coach and how you can earn 25% or more commission on these amazing products that actually work and are backed by a 30 day guarantee, message me and we will set up a phone interview to see if you are a good fit for our Team. We want positive, like minded people who want to help others and make some extra $. I'll show you the ropes, provide training and really mentor you-- I truly love seeing team members succeed. My passion is helping others have SUCCESS! New 5 week dance workout test group forming now. Dancing is a great way to burn calories, get in shape and lose weight. Our 5 week group includes a meal plan, meal prepping videos, worksheets and guidance, peer support in a private group, and my personal support. This is great for busy moms because its all done online and in your home! Spots are limited to 10 ladies in July. Apply below.